This is the third in a series of three articles about struggling with past tense -ed and instructional techniques to help. We are continuing the series on ELL pronunciation struggles with the past tense -ed. The articles published in this series: Part 1: Struggling with the past tense: Verbal acquisition of -ed forms of verbs and Part 2: Struggling with the past tense: Verbal acquisition of -ed forms following monophthongs in verbs. In this third part of the series, we are addressing verbal fluency of past tense -ed following monophthongs, one vowel sound in one syllable. Using -ed after a monophthong is much easier than when it comes after a diphthong. Regardless of which type of vowels -ed follows, students need to still understand how to pronounce them. Have you had students practice language in video-recorded skits? The pronunciation for the -ed added after any monophthong is pronounced the same as it is for verbs that end in diphthongs or in voiced consonants. It is pronounced like the [d] in the word "did" (as discussed in Parts 1 and 2 of this series). Look at the verb "wave" that ends in the voiced consonant sound "v." When -ed is added after the voiced "v," this word is pronounced "wavd" even though it is spelt "waved." The same -ed pronunciation concept applies to verbs that end in vowels. For example from Part 2 of this series, when the -ed is added after the verb "play" that ends in the vowel diphthong "ay/ey," the -ed is pronounced "playd" although the spelling of the word is "played." With frequent pronunciation practice and reinforcement, ELLs will gain fluent acquisition of the various vowel sounds. As with adding -ed to any verb, students must understand the basic pronunciation rules and understand how to pronounce the ending sounds of the verbs before they can add -ed. Once this is acquired, -ed can be added through practice in whole group, pairs and individual tasks and exercises. 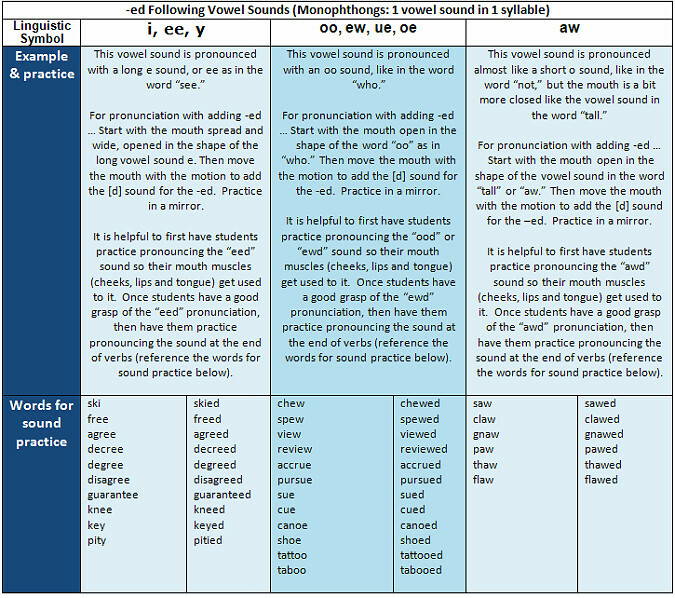 Refer to Part 1 and Part 2 of this series to review practice techniques and exercises for adding -ed after voiced and unvoiced consonants and following diphthongs. Instructional note: Monophthongs happen when one vowel sound is made within one syllable, which is different from the two vowel sounds in one syllable of diphthongs. Pronunciation of various monophthongs is listed in the chart below. After students learn how to adequately pronounce the monophthongs, then practice can transition toward pronouncing verbs ending in monophthongs followed by -ed. A few of the monophthongs in the chart below have more than one spelling for the vowel pronunciation. For this reason, there are numerous examples included for practice purposes. You can have students practice these vowel sounds with the same practice techniques and exercises indicated in the instructional notes of Part 2 in this series. Also, please note that it is important to have students memorize the spellings to these vowel sounds so that when they read them aloud, they will recognize them and know how to pronounce them. Have students write rhymes or chants with various verbs with -ed. It is better to have them first write a rhyme with the one -ed pronunciation. Once they have practiced and have good fluency of the rhyme, then have them write a chant using various -ed pronunciations. Have students in pairs or groups create skits: interviews, mock movies, radio/TV advertisement announcements, podcasts, plays, etc., that include -ed pronunciations. Video record their skits. Then have students watch the video, paying close attention to their -ed pronunciations. Students can do a surveys or critiques of their pronunciations. Finally, students can do goal-setting to determine areas they think they should improve upon. If students have weak mouth muscles because they don't use a particular muscle in their native language, have students put a straw between the lips and count to 10 holding the straw in place. This can help develop the lip and cheek muscles. That will develop muscles for sounds like "oo" or related sounds. The instructor can also have students do a big smile and hold it for 10 seconds. This will help develop muscles for "ee" and related sounds. Doing these exercises is like lifting weights. Have students do reps of 10 and rest. You can also cross train by having students do "oo," "ee," and repeat into reps.
Have students practice reps of the various -ed sounds, [d], [əd], and [t]. Focus should be placed on the placement of the tongue in the mouth. Mouth and tongue muscles can develop more if you have student cross train as well by moving between [d], [t] and [əd]. Mixing it up in a different order helps too. Even though English words don't naturally flow in this form, by cross-training -ed sounds, the mouth muscles develop stronger. As always, continuous practice and reinforcement of the -ed added to consonants and vowels at the end of verbs will help students overcome their pronunciation struggles. Reference and use the techniques covered in this series as well as other instructional techniques to help ELL students transition from pronunciation struggles to fluency of the verb followed by -ed.